We’d love your help. Let us know what’s wrong with this preview of Welding with Children by Tim Gautreaux. Tim Gautreaux returns to the form that won him his first fans, with tales of family, sin, and redemption: from a man who realizes his grandchildren are growing up without any sense of right or wrong, and he's to blame; to a camera repairman who uncovers a young woman's secret in the undeveloped film she brings him; to a one-armed hitch-hiker who changes the life of the man who gives her a ride. Each one a small miracle of storytelling and compassion, these stories are a joyous confirmation of Tim Gautreaux's rare and generous talent. To ask other readers questions about Welding with Children, please sign up. Eleven excellent short stories, each one a wonder of insight into the kind of people we all know. The first story made me laugh out loud more than once. This book was published in 1999, so I'm really looking forward to his new collection. It's rare than an author can do both novels and short stories equally well, but this one can. This book is bogus!!! SO you asked what happend my friends??? I wanted to teach my 3 year old to weld. so i told him to read this book, i thought he knew how to read. I thought he was old enough.. I was wrong.. he welded for 2 hours without parental supervision and never put his welding helmet down.. he is now blind for the rest of his life. FML. I just might sue this book, for not teaching him the right technique. I have no idea why Gautreaux hasn't been on my radar before this. What a splendid writer. These stories are funny, poignant, compassionate, and wise. I will be recommending all my creative writing students run out and buy his books. Some of the stories really knocked my socks off. Sorry Blood and Easy Pickings were my favorites, and I imagine I'll read them many times. Some of the other stories were also excellent, and there were a few that were good but not great. I will be seeking out his other books, books for sure. Years ago, I read the title story and it stuck clearly enough in my mind that when I ran across a copy of the book, I wanted to read it. Considering that I have forgotten entire novels, this is notable. The story remained much as I had remembered it; the first person recounting of a day spent caring for his daughters' children, and the realization that he is not free from blame in his daughters' life choices. Set in a small town in Mississippi, there's both a strong atmosphere of people not quit Years ago, I read the title story and it stuck clearly enough in my mind that when I ran across a copy of the book, I wanted to read it. Considering that I have forgotten entire novels, this is notable. The story remained much as I had remembered it; the first person recounting of a day spent caring for his daughters' children, and the realization that he is not free from blame in his daughters' life choices. Set in a small town in Mississippi, there's both a strong atmosphere of people not quite getting by, of cars rusting in side yards next to decaying porches, and an undercurrent of hope. That sense of resilience is, along with rural Mississippi, the common themes of this excellent and diverse selection of stories. Gautreaux takes set-ups that with Daniel Woodrell or Donald Ray Pollock would end in a blood bath and steers them in unexpected directions. In one story, a desperate criminal's home invasion is written with an off-beat humor, as he is thwarted by the elderly woman he finds in the house, and as her neighbors notice something is wrong. In another, an old man, disoriented in the Wal-Mart parking lot, is kidnapped by a carelessly cruel opportunist. This is the harshest of the stories, but there is a bright note in the man's desperate attempts to remember his past. Other stories deal with the remnant of a leading family, living in her decaying house and relying on the piano tuner for company, a priest whose drinking problem and inability to say no lead him into illegal acts and middle-aged man attending a writing workshop finds that he may be the only attendee with a desire to improve his writing. This was a terrific collection of short stories all set in the American south against a backdrop of multi-generational poverty. I do love writers who can inject a little humour into sad stories. It adds warmth, somehow. Some of these stories were seriously funny. Short stories set in Louisiana (for most of them). I read this three years ago. My favorites are the title story, the one about the alcoholic priest, the one with the photographs of the ship, and the home invaders story. I love short stories that have an actual storyline and plot, as opposed to just some guy sitting in his kitchen and mournfully remembering how the trees outside used to have leaves on them, or whatever. These were excellent. I will be checking out his other collection ASAP. Excellent. Each story leaves you wanting more. Made me miss home and driving the back roads of Louisiana. Great LA characters. Uneven, some of the stories really fine. All these stories were very entertaining, but “Sorry Blood” had me on the edge of my seat so to speak. I worried through most of the story about the old farmer with Alzheimer’s. When the old man was picked up by a stranger claiming to be his son, I was furious with the way he was being exploited. The slob who took advantage of the confused old man was so grotesque that I wanted him to get his due in the worst way. Others have compared Gautreaux to Flannery O'Conner and I can see the resemblance All these stories were very entertaining, but “Sorry Blood” had me on the edge of my seat so to speak. I worried through most of the story about the old farmer with Alzheimer’s. When the old man was picked up by a stranger claiming to be his son, I was furious with the way he was being exploited. The slob who took advantage of the confused old man was so grotesque that I wanted him to get his due in the worst way. Others have compared Gautreaux to Flannery O'Conner and I can see the resemblance in characters who come from society's dark and ugly side. In spite of the inhumane way that the old man was taken advantage of, in the end I was beginning to feel sympathy for the stranger whose life was so pitiful and hopeless. Thank goodness the farmer's memory loss wasn't so severe that he eventually realized the predicament he was in and was able to escape. Along with the serious and often difficult situations developed in these stories was a subtle humorous way of looking at pieces of humanity. The eccentric young woman in “The Piano Tuner” was another favorite character of mine. It must have been a sight to see her pull the old piano out of the house on the hill with a tractor. This was a perfect lunch hour book for two reasons. First, each short story in this collection takes about 45 minutes to read start-to-finish, so the logistics couldn't have been better. And second, these stories take place for the most part in southern Louisiana (though not New Orleans), and I enjoyed getting that far out of the office each day. Though each short story is self-contained and capable of standing on its own (no recurring characters), they all seem to complement each other. Each su This was a perfect lunch hour book for two reasons. First, each short story in this collection takes about 45 minutes to read start-to-finish, so the logistics couldn't have been better. And second, these stories take place for the most part in southern Louisiana (though not New Orleans), and I enjoyed getting that far out of the office each day. I loved Gautreaux's novel, "The Missing," and was so pleased when my daughter gave this collection of short stories to me for my birthday. It did not disappoint - unlike some collections which are quite repetitive in either theme or similar characters, Gautreaux gives us eleven stories that are completely different. Some are humorous, some bittersweet, some quirky; but all feature unique Louisianans that will keep you entertained. The only bad thing about the book: it's not long enough. I read a lot of stories, and Tim Gautreaux has a voice unlike any other. His particular Louisiana tone is so precise, the strangeness of some of his characters is heartbreaking. They are everyday and odd at the same time. As the title of the collection indicates, they take risks and do things that no "ordinary" person would dream of doing, and they somehow seem not to regard the perils as we think they should. We cringe at the choices they make, we hope for the best, we turn the page, we sih. I liked this collection better than Same Places, Same Things, though I gave them both four stars (I'd be in favor of a 100 star rating system). So many contemporary short story authors equate "bleak" with "literary." In Welding with Children, Gautreaux demonstrates how a story can be hopeful without being cheesy or unrealistic. This is my first Tim Gautreaux book, but certainly not the last. He has outstanding storytelling skills. The characters and storylines are fresh, interesting, and diverse. The short stories feel complete, yet at the same time there's a sense that each story existed before and after the episode I read. This was a page turner that I didn't want to end. This is a collection of excellent short stories. There were a number that were so real and touching; others were delightfully funny. Perhaps the stories seem more true because they take place in South Louisiana...and I do know a few folks just like the ones in the stories. It was a pleasant read. 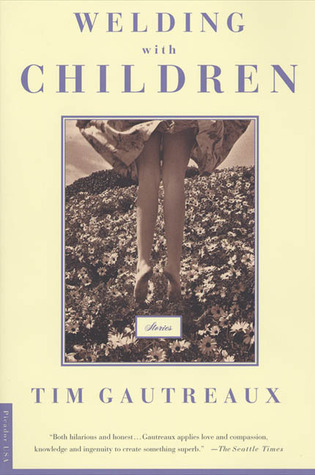 Tim Gautreaux was my creative writing professor in the 70's. My grown daughter gave me this book for a birthday present, as she knew how highly I thought of Dr. Gautreaux. I had forgotten what a splendid writer he was. The title story, Welding with Children, is both heartbreaking in parts and laugh out loud funny in other parts. Wonderful, wonderful stories. I picked up this book because if the title - how could you not be intrigued? I was touched by the grandfather who wanted advice on how to improve his families chances for a better life. These are great stories! I loved every one of these stories. Each had an ongoing tension to pull you through the story and each had unique characters that you can't find anywhere else. Great book for anyone who loves Southern fiction. The voice, the voice, the voice! A true ventriloquist with his characters but the honesty and heart of this author is heard in the placement and sound of every word. A magician of precision in tight, full writing, however impossible that seems! I savored every story. Yummmm! Spotted this book in the book stack at Goodwill. Got my money's worth. Effective title-made me pick it out of a row of books. I've read other books since then, but didn't realize it was the same author until then. Really good stories well written. Beautiful language, compelling characters, engaging stories! Interesting short stories. "Easy Pickings" was hilarious. You'll never really know why you like this book as much as you. But there's a symmetry and poetry that make it a classic. Absolutely wonderful, especially the title story. Southern short stories. A great and varied collection. Loved it! We read this for a college class and I remember it being a fantastic collection of short stories. I would draw a comparison between Gautreaux and Flannery O'Connor. Unfortunately this is not instructional and at no point involves the use of children as flux. I rolled the dice; I lost. Timothy Martin Gautreaux (born 1947 in Morgan City, Louisiana) is a novelist and short story writer who lives in Hammond, Louisiana, where he is Writer in Residence at Southeastern Louisiana University. His writing has appeared in The New Yorker, Best American Short Stories, Atlantic, Harper's, and GQ. His novel The Next Step in the Dance won the 1999 SEBA Book Award. His novel The Clearing won the Timothy Martin Gautreaux (born 1947 in Morgan City, Louisiana) is a novelist and short story writer who lives in Hammond, Louisiana, where he is Writer in Residence at Southeastern Louisiana University. His writing has appeared in The New Yorker, Best American Short Stories, Atlantic, Harper's, and GQ. His novel The Next Step in the Dance won the 1999 SEBA Book Award. His novel The Clearing won the 1999 Southern Independent Booksellers Alliance SIBA Book Award and the 2003 Mid-South Independent Booksellers Association Award. He also won the 2005 John Dos Passos Prize. Gautreaux also authored Same Place, Same Things and Welding with Children—collections of short stories. His 2009 novel The Missing was described as his "best yet" by New Orleans Times-Picayune book editor Susan Larson in a featured article.